The Sandwich tern (Thalasseus sandvicensis) belongs to the family of gulls and terns, the Laridae. The Sandwich tern species is distributed in southwest Asia, South and central America, southern and western Europe, Africa and India. These tern species have characteristic black bill with yellow tip. These terns are polytypic species. The Sandwich tern (Thalasseus sandvicensis) is a medium-sized tern, measuring 35 to 45 cm in length and weighing 130 to 310 grams. The wingspan is 85 to 100 cm. The Sandwich tern has white underparts and underwings. The upperwings are pale gray. The wings are long and pointed. In summer, there is a black cap. The black forehead has white speckles. The white tail is forked. In winter, the forehead becomes white and the black cap gets reduced. The thin sharp bill is black with a yellowish tip. The bill is dark gray in juveniles. The irises are blackish. The legs are short and blackish gray in color. The juveniles have gray patterns on the head and wings. Their call is a loud "kear-ik..kear-ik..kear-ik" sound. The Sandwich tern species is distributed in southwest Asia, South America, southern Europe, western Europe, central America, Africa, Persian Gulf, Pakistan, India and Sri Lanka. In India, wintering Sandwich terns are distributed in the coasts of Gujarat and Tamil Nadu. Breeding populations of these terns are distributed in Turkmenistan, Kazakhstan, Ukraine, Romania, Greece, Italy, France, United Kingdom, Ireland, Belgium, Denmark and eastern coast of USA. The Sandwich tern nominate subspecies T. s. sandvicensis breeds in Europe and southwest Asia. Wintering populations are found in south, west and north African coast, middle East, Pakistan, India and Sri Lanka. The Sandwich tern subspecies T. s. acuflavidus is distributed in the eastern coast of USA, Caribbean Islands and South America. The Important Bird and Biodiversity Areas (IBA) of the Sandwich tern species in USA are, Altamaha River Delta, Big Foot Island, Bird Key Stono, Deveaux Bank, Ferry Slip Island, Jigsaw Islands, Tomkins Island, Sand Bag Island and Sundown Island. Some of the IBA of the Sandwich tern in France are, Littoral Augeron, Ilôts de Trévorc'h, Iles Chausey, Ile de Goulmedec, Estuaire et embouchure de la Seine, Cap Gris-nez, Camargue, Archipel des Glénan and Baies de Morlaix et de Carantec. These Sandwich tern species do not normally occur in forest. They normally occur in altitudes from 0 to 100 meters. The natural ecosystems and habitats of these Sandwich tern species include, intertidal mud flats, coral reefs, lagoons, estuaries, open seas, shallow seas with macroalgal growth, sandy, rocky, shingle or pebble shorelines. The diet of the Sandwich tern consists mainly of surface-dwelling marine fish. Crustaceans, polychaete worms, shorebird nestlings and marine fish are their primary food. They feed by plunge diving for fish in marine environments. 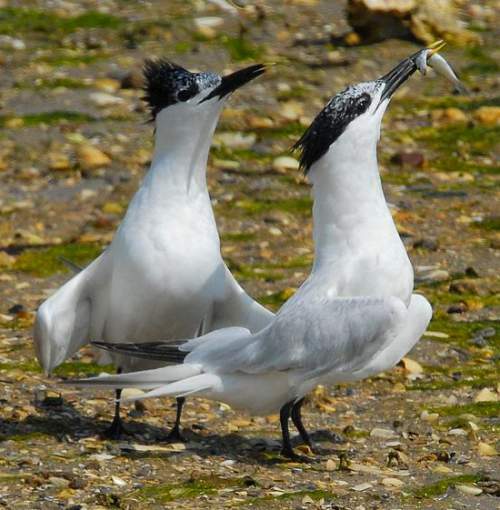 The breeding season of these Sandwich tern species is during May and June in Europe. The laying season is during June in Brazil. The breeding season is during December in Argentina. The Sandwich tern is colonial breeder. The breeding sites are located on coasts and islands. The nest is a shallow scrape on raised, open, unvegetated grounds. The clutch contains one to three, pale, cream colored, oval eggs with dark speckles. These Sandwich tern species are mostly migratory birds, breeding in northern ranges and flying south for wintering. These terns return to their breeding grounds one or two months before nesting. Some populations in South America are resident. The global population size of the Sandwich tern (Thalasseus sandvicensis) is estimated to number 490,000 to 640,000 individual birds. The overall population trend of the species is considered to be stable. 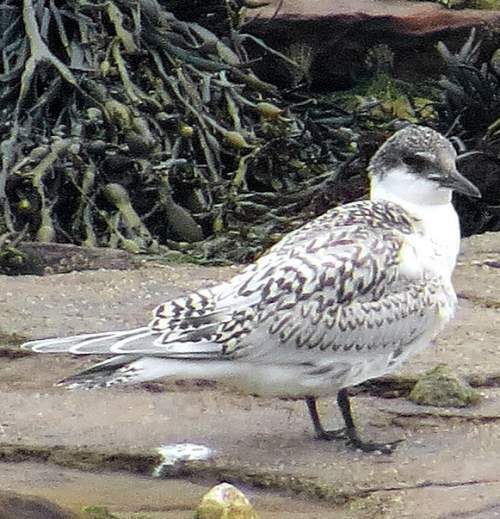 In most of its range, this tern species is reported to be rare and locally common. The generation length is 10.8 years. Its distribution size is about 87,000,000 sq.km. Habitat alteration and destruction, pollution, hunting, egg collection, disturbance from human activities, climate change and severe weather are the main threats that are endangering the survival of this species. The Sandwich tern (Thalasseus sandvicensis) does not approach the thresholds for being Vulnerable either under the range size criterion, or under the population trend criterion or under the population size criterion. The CITES (Convention on International Trade in Endangered Species of Wild Fauna and Flora) status is ‘Not Evaluated’ for Sandwich tern (Thalasseus sandvicensis). The Sandwich tern (Thalasseus sandvicensis) is closely related to the elegant tern (Thalasseus elegans), lesser crested tern (Thalasseus bengalensis) and Chinese crested tern (Thalasseus bernsteini). The two recognized subspecies of the Sandwich tern (Thalasseus sandvicensis) are: Thalasseus sandvicensis sandvicensis (Latham, 1787) and Thalasseus sandvicensis acuflavidus (S. Cabot, 1847). 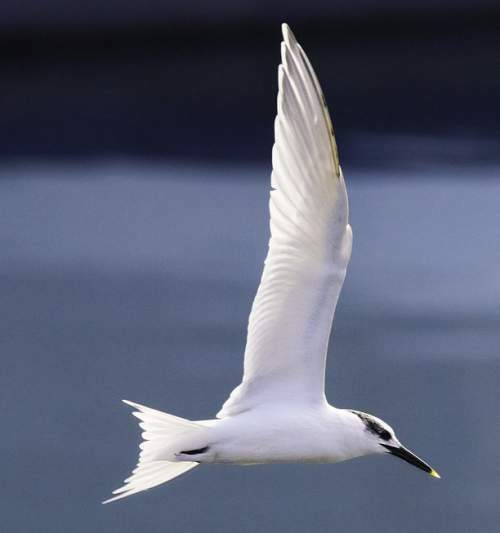 Current topic in : Sandwich tern - Thalasseus sandvicensis.